My Big Adventure – Friday July 28th! Well, I am thankfull to God and modern medical science that I am able to write this today. On Friday morning, I thought I was just having another bout of Acid Reflux, I had a stress test done two years ago and a bunch of other tests – at that time I was told the pressure and pain in my chest was from Acid Reflux. On Friday morning I though – just don’t eat anything that will make it worse – well by noon – it got a lot worse and I was feeling like a large person was sitting on my chest – I also had a very real “pending doom” feeling – by ten minutes to one – I was ready to see if my wife could drive me to emergency. I could not get her on the phone so I walked to my boss’s office and told him “I think I might be having a heart problem”. The department head heard this next door and came in – 911 was dialed – meanwhile a coworker who has had a number of stents put in his heart and a mild heart attack back a few years ago walked by. He gave me a nitro – the pain went away before the firemen got there about two minutes later. They got in touch with my wife and she arrived at about the same time as the ambulance crew. I got a ride to the hospital with oxigen and monitors hooked up. After about three hours in the emergency room, the cardioligist got an immediate appointment with the Cath Lab. I was wheeled directly there from the ER and by 6:00 I had two stents in my heart. 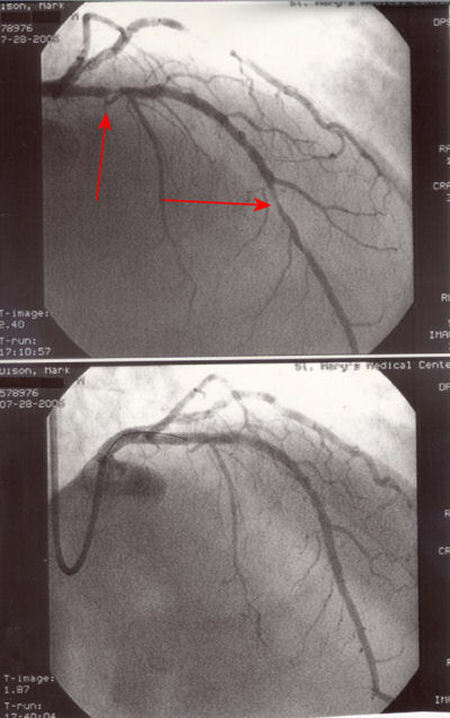 The red arrows show where I had blockage – the bottom show after the stents were inserted and them open again. The whole thing was not any more uncomfortable than getting your teeth cleaned! I caught it in time – they say I did not do any damage to my heart – I was walking at 2:30 am (in the moring) Saturday and went home at 10:30 am Saturday. The whole thing took less than 24 hours. I am now on some blood thinners and some other drugs to keep the stents from closing up – but that is nothing like what my father went through when he had a heart attack 30 years ago – he was laid up for weeks and it eventually killed him seven years after he had it. I am sure glad I had a fully staffed hospital like we have here and the moderen science that can do things like this. I am going to have to change my life even more – if I want to enjoy more of it but at least I should be ok for a while. My genes are the biggest factor – I don’t smoke (ever) and don’t drink – however I like cheese – I asked if the blockage was Chedder or Colby – hehehe! I would not want anyone to have heart trouble but if you think you are having a heart attack – don’t wait! Don’t be a “hero” – the medical profession is very expensive but they have come so far in this area – give them a chance to help you – I know I thank the Lord I went in and found out what was wrong. It is really wierd laying there with my glasses and hearing aid still on watching the monitor and seeing them do what they did. I was awake the whole time. The worst part of the entire stay was the eight hours flat on my back after the stents were put in – this with a pressure device applying pressure to my Femure Artery to keep it from opening up. I just have to be careful not to lift anything heavy for a week or so and my life is back to normal – as normal as ever. Visited the Gilmore last Saturday – long trip – great time! Anyway – we drove all day Friday, stayed in Kalamazoo and got out to the museum about 9:00 (local time.) 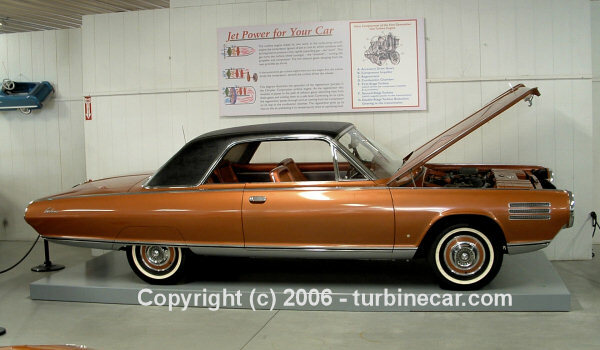 We looked at a lot of very nice Mopars and toured the “Barns” – great place. I took a whole lot of photos. Take a look at them here – GILMORE MUSEUM 7-22-2006. I also took a ton of photos of the Detroit Historical car – Watch for more on that here later. Not enough time to do them right.